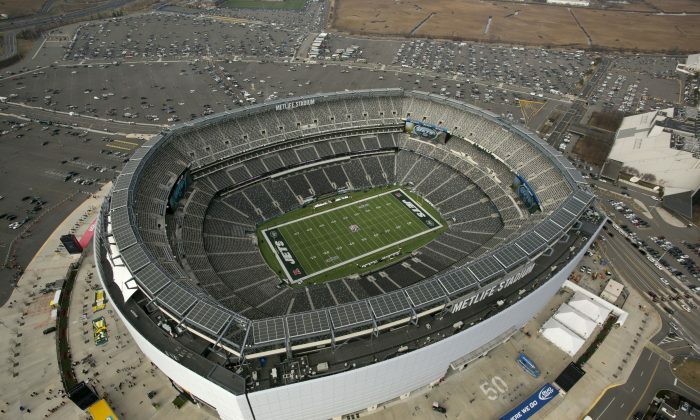 NEW YORK—Over 500,000 visitors are expected to converge in New York and New Jersey this February for Super Bowl 2014. As a result hotels and restaurants expect a boost during an otherwise quiet period. Some hotels reported a 35 percent increase in bookings, said U.S. Rep. Carolyn Maloney Sunday. The New York Super Bowl costs a record $70 million, but it is expected to generate as much as $600 million for the city and state, according to the NFL. Although the number of visitors has not been determined, Geoffrey Mills, chair of the New York City Hotel Association hopes that hoteliers will benefit from a second wave of bookings in the next two weeks, once the final contestants have been fixed. Around 5,000 journalists from 25 networks will be staying at the Sheraton Midtown during the event. Currently, 10,000 workers are giving the MetLife Stadium a makeover, which includes building a two-and-a-half mile-long chain-link fence that is 6 feet high and fitted with 130 metal detectors that will surround the stadium. When the big game comes to town, a Super Bowl Boulevard will open in Manhattan, featuring a 180-foot toboggan slide on 40th and 41st streets. Elliot Hurdy from World Tickets predicts that theater tickets will also be sold out during the game as visitors enjoy the city. “The ripple effect is tremendous,” said John Tsunis, chair of the New York State Hotel and Hospitality Association, adding that the Super Bowl has the potential to generate many jobs in the hospitality industry.